A mid-wave infrared (MWIR)/long-wave infrared (LWIR) dual-band zoom lens design with multilayer diffractive optical elements (MLDOEs) is presented. The mathematical relationship between the substrate material selection for dual-band MLDOE and polychromatic integral diffraction efficiency (PIDE) is deduced in the oblique incident situation, and further, a method for optimal selection of substrate material is proposed to obtain the high PIDE in an incident angle range. 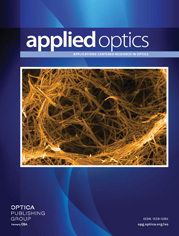 In the optimization process, the optimal substrate material combination is selected based on the proposed method, and the principle of lens material replacement is discussed. After optimization, the 5× hybrid dual-band infrared zoom system is obtained, which consists of seven lenses. The modulation transfer function values in all configurations are larger than 0.5 and 0.3 in MWIR and LWIR, respectively. The distortion values are less than 2% both in MWIR and LWIR for all configurations. a Binary 2, normal radius of diffractive surface ρ = 105 mm , diffractive phase coefficient of surface 2 A 1 = 89.996 , diffractive phase coefficient of surface 3 A 1 = − 89.996 .